Unions can be a beautiful thing, and the dissolution of them should, generally, be avoided at all costs. Staff at the Kennebec Valley Humane Society (KVHS) know how important this is, so when two of their dogs were desperate not to be separated, they did the sensible thing and made sure they stayed together. 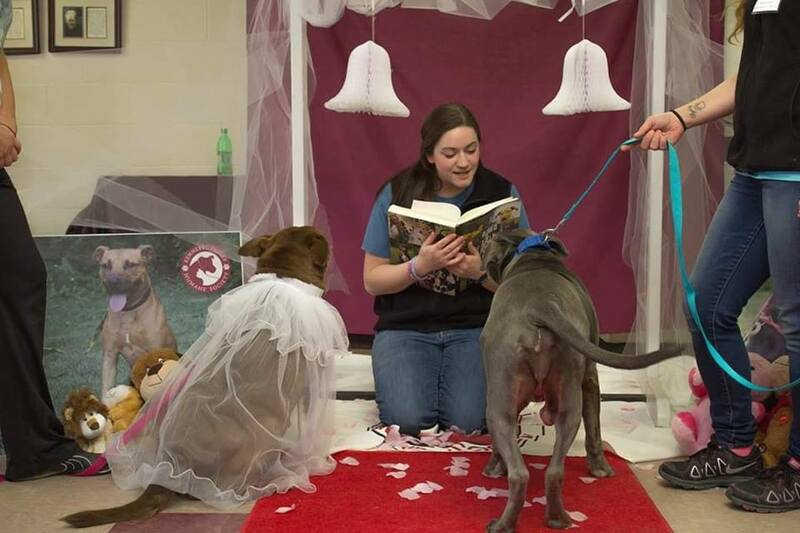 The pair – two senior, mixed-breed dogs called Jack and Diane – were wed earlier this month by staff at the animal shelter in Augusta, Maine. In a bid to make sure the devoted dogs were kept together, if and when they’re adopted, staff thought marrying them would be the ideal solution, as no one would force a divorce on the coupled-up canines, right. The dogs were found in a cemetery in August last year, with their leashes tied together. Obviously close, the staff soon realised the pair were inseparable as they would snuggle together ‘for hours’. Stevanie Roy, director of operations at KVHS, told HuffPost how ten-year-old Jack is laid-back, mainly motivated by doggy treats but, most importantly, a true gentlemen to his partner. Stevanie said Jack ‘sacrifices all toys and comfy beds for his lady, keeping chivalry alive’, while seven-year-old Diane ‘seems to be the boss’ in the relationship. [Diane] always gets super excited when getting reunited with Jack, and is always found doing a little dance when she sees him coming towards her. Staff at the shelter ‘have always called them our old married couple’, so decided they should make the union official and hold a wedding for the pair. Which is exactly what they did, complete with confetti, witnesses and a little doggy alter for the bride and groom, who seemed more than happy to enter into the ritualised institution of marriage. 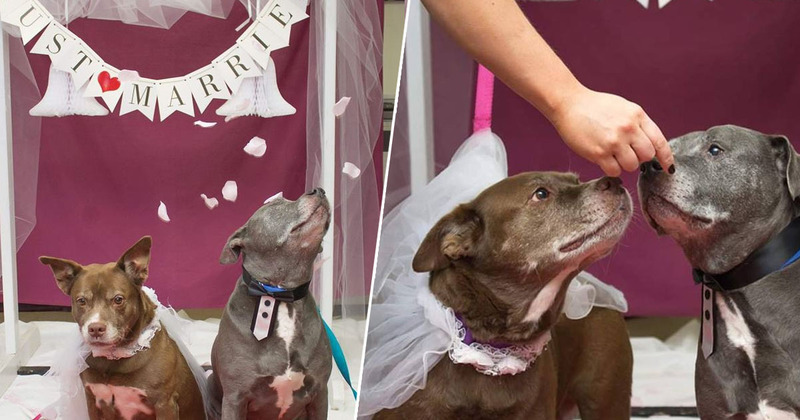 Complete with a veil for Diane and a bow tie for Jack, Diane was walked down the aisle before the ceremony was officiated by staff at the shelter, enjoying a pizza party as the reception afterwards. Jack and Diane have been adopted once before, but were returned to the shelter after the adopters ‘quickly learned that they would be a better fit in a quiet retirement home’, according to Stevanie. The shelter is now looking for potential adopters who might be able to give the newly weds the quiet, homely life they’re looking for. If you’re interested, you can contact KVHS here.